Creating Invoices is a Snap! My Music Staff makes sending invoices and getting paid easy. 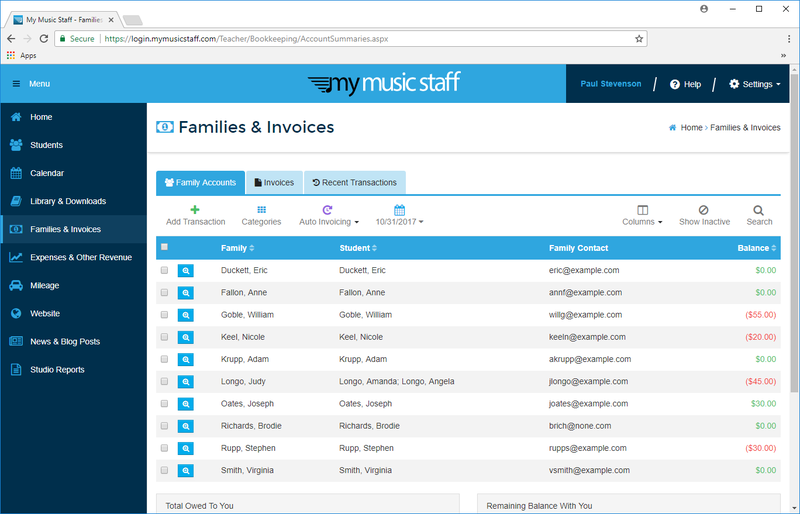 My Music Staff can automatically use your student and schedule information to figure out who owes what, so you can generate and send detailed, professional invoices in seconds. Best of all, My Music Staff works with all types of studios. It doesn’t matter if your families pay before the month (prepay), pay after the month (post-pay) or they pay at their lessons, My Music Staff can help you stay on top of it all. Every studio is different, so My Music Staff offers a variety of options that let you create invoices for the way your studio works. When you schedule lessons on the calendar, My Music Staff can automatically generate per-lesson fees or monthly tuition. When it’s time to create invoices, you choose which dates to include. It doesn’t matter if you invoice weekly, monthly, annually or something totally different (like custom semesters). You’re in complete control. Get your “staff” working even harder for you by setting up automatic invoicing and have My Music Staff send out your invoices on a weekly, monthly or annual basis. For those of you with complex needs, you can even use different automatic invoice settings on a family by family basis (i.e. some families could be invoiced every 6 weeks while others are invoiced monthly). As with many of the features in My Music Staff, automatic invoicing is completely optional. If you wish to manually create and email the invoices for your studio you can do so by using the regular invoicing features. 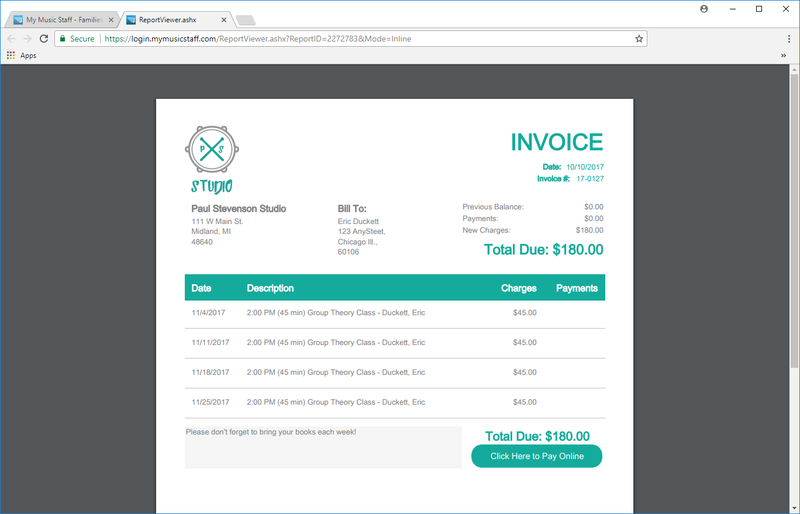 You can customize the look and feel of your invoices by adding your own logo, accent color, studio name, address and footer. My Music Staff also lets you control the amount of detail that’s included on your reports with “Normal”, “Expanded” and “Condensed” options. It’s also easy to add one time fees and credits. For example, if you have a new student sign-up fee, you can easily add that onto the student’s account and My Music Staff will automatically include it on the next invoice. Cash, check, credit card and online payments? No problem, you can accept them all. Click here to learn more. Your PayPal or Stripe account can be linked to My Music Staff! If students pay an invoice online or by credit card, the payment details are automatically captured by My Music Staff. 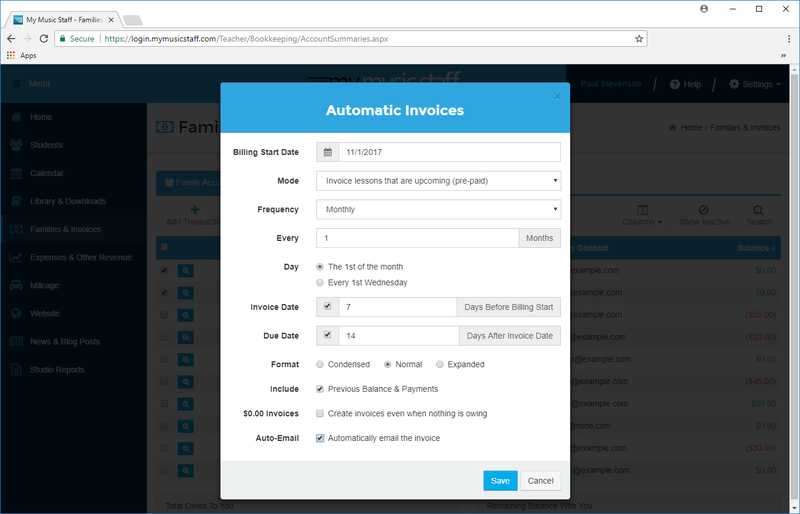 Pair automatic invoicing with Auto-Pay – your clients can store a credit card or bank account on file and you can bill them automatically when you send your invoices! All the data entry is done for you, saving you even more time. The only thing it can’t do for you is teach!